The third edition of the Universal marimba competition, Belgium 2007 was held from 16 till 24 August 2007 in the beautiful sounding wooden ‘academiezaal’ in the town Sint-Truiden, near Brussels. (A festival was held in conjunction with the competition showcasing clinics and concerts by the jury members, finalists 2004 & extra guest-artists in several historical venues). 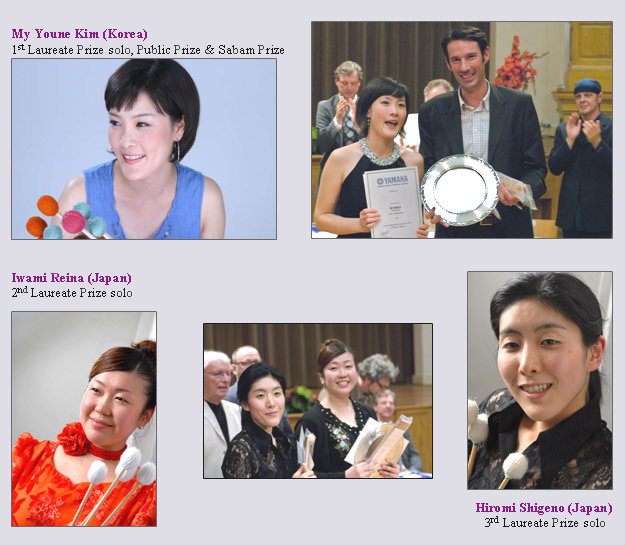 For marimba solo 3 final laureate prizes were given to: 1st Prize to Mi Youne Kim ( Korea), 2nd Prize to Iwami Reina (Japan) & 3rd Prize to Hiromi Shigeno (Japan). The extra public prize and Sabam Prize ( best performance of set piece Nimbostratus by L.Albert) were awarded to 1st prize winner Mi Youne Kim. 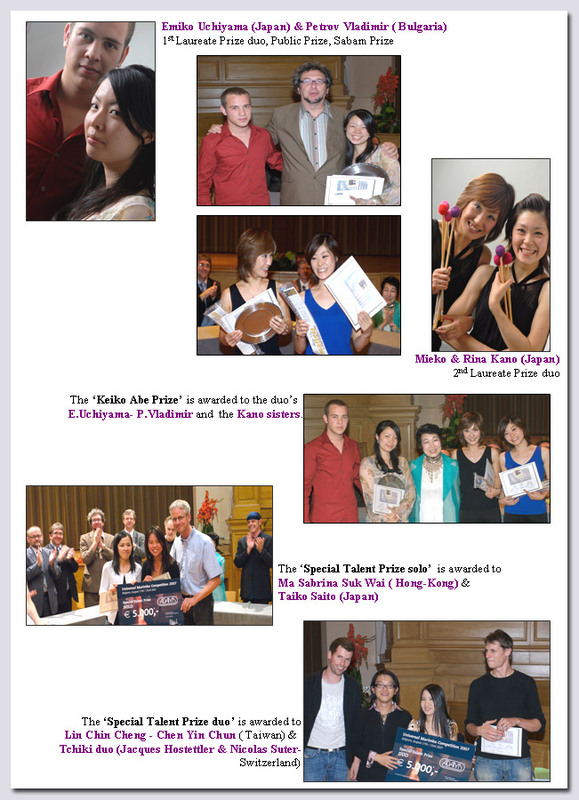 For marimba duo the 1st prize , public prize and Sabam prize ( best performance of the set piece the Kundalini of the playing Koala’s) were given to Emiko Uchiyama & Petrov Vladimir. The 2nd Prize was given to Rina & Mieko Kano. The extra ‘Keiko Abe Prize’ is awarded to both duo finalists. -Hirotake Kitaka for the composition W=Mirror for marimba duo performed by Mieko & Rina Kano. The event’s artistic director and founder of the competition Ludwig Albert assembled the other jurors: Anders Loguin (SE), Keiko Abe (J), David Friedman (DE-USA), Igor Lesnik (HR), Leo Ouderits (BE), Frédéric Macarez (FR) & Klaus Tresselt (DE). Extra jury members and Belgian representatives for the final round were: Jan Van Landeghem (BE composers society SABAM), Liesbet Vereertbrugghen (BE-National Radio & Television Network), Alain Crains ( BE-higher education of music). 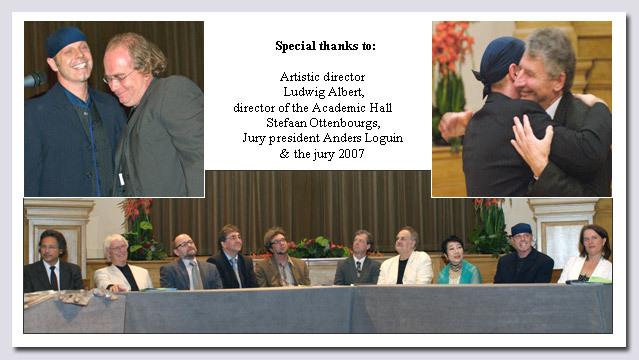 The award of honour 2007 was given to following artists for their tremendous contribution in the marimba & percussion field: Anders Loguin, David Friedman & Frédéric Macarez.